It’s a keen sentiment for this moviegoer’s experience of seeing author Lois Lowry’s seminal book come to life as a motion picture. 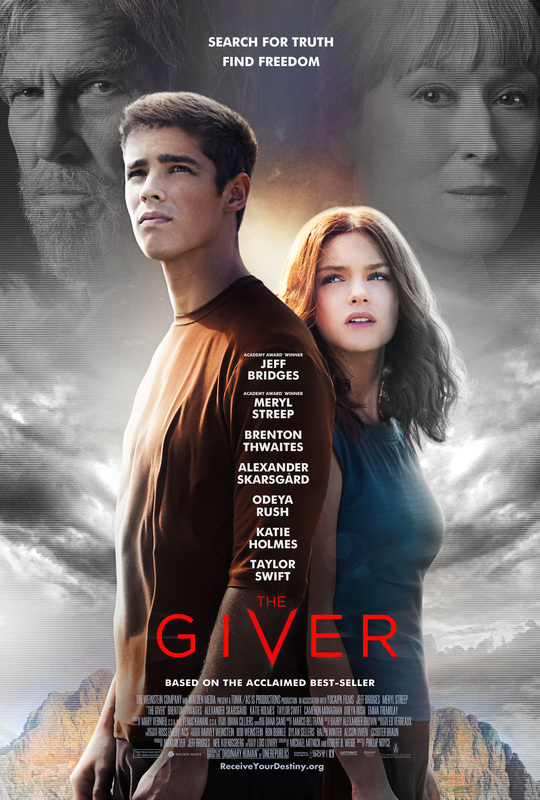 THE GIVER flicks a switch that is, at first, skin deep. It punctures all that I think I know about the human condition. As the story of Jonas’s journey through a dystopian society unfolds, as we see a beautiful, clean world filled with attractive people who are all seemingly content, I squirm restlessly in my moviegoer’s seat. Then, like the needles in Jonas’s world that inject a serum to numb all emotions, impulses, urges, and desires, the film’s nuanced script starts to go blood-deep. It begins to take hold. To have an effect. And as I try to find comfort in my moviegoer’s seat, I ask myself, What if I could be vaccinated, freed of all pain and bad memories? What if I could be put into a state of numbed ignorance? Relieved of big anxieties ― fear of war, rage in the face of racism, despair over genocide. I watch how Jonas, along with his family, friends and elders exist in this place. They seem to be doing fine. But then there are more injections. More voiding of all that is meaningful. This seemingly perfect landscape that insists those who speak use “precision of language” to avoid words that might hint at emotion, starts to show its true colors ― which are no colors at all. Soon THE GIVER’s powerful cinematic expression of this society, rendered solely in black and white, starts to look bleak. It turns colder than the snow that has been banished from this universe to avoid crop failures, weather disruptions, and cold feet. We’re not even half way through the film, and I’ve resigned myself to the fact that I will never find comfort in my moviegoer’s seat. I’m doomed to feelings of despair and hopelessness for the remaining ninety minutes of the movie’s running time. movie camera that stays fixed on frame after frame, for moments too long, forcing me to look. You’ve lured me with your stagnant dramatic pacing, your austere art direction. And, oh, the injection. It’s starting to go bone-deep. I’m now stuck in my moviegoer’s seat. Can’t leave. Can’t escape. But then young Jonas becomes The Receiver of Memory who meets The Giver, the wise man who will lift Jonas ― and me ― out of our drudgery. Yes, yes, I know what’s coming next. I can breathe a bit, even though the movie’s big dose of emotional scarcity and lack of passion is still potent. As Jonas receives his instruction from The Giver, as he starts to unthaw, so do I. This boy-to-man, who, through his world’s rite-of-passage ceremony has been thanked for his childhood, is about to experience a seismic psychic change. Hurry! I whisper to the writers of the screenplay as it illuminates the intensity of Lois Lowry’s novel. Hurry up, I beg, this moviegoer wants her agitation gone. Or maybe I really want a shot of that magic serum that would free me from the twisted-up emotions that have strapped me tightly in my moviegoer’s seat. I breathe. Deeply, I breathe. But I’m forced to ask myself, Am I allowed to exhale in this utopian dystopia? The film’s taut pacing makes me wonder. Then comes the color red. A warm bolt of hope in the midst of the movie’s art direction, effectively, deliberately rendered in gray. In time, Jonas, through his lessons with The Giver, is able to receive ― and to see: color, warmth, choice, truth, and perhaps the greatest gift of all, memories. I breathe. More and more, I’m able to breathe. Thank you, filmmakers. Thank you, big screen. Now comes the inevitable. Something common and complex that lives in the heart of every ordinary human. Something newborns know when their eyes meet the gaze of one who understands. Something each child will experience when he or she is free to speak beyond “precision of language.” This thing, this hard-to-describe thing, is what every boy-to-man and girl-to-woman will feel when he or she is stirred by desire. The inevitable lets me soften, allows me to relax in my moviegoer’s seat. In the dark of the theater, I glance at my husband on my right. Then turn my eyes to my daughter on my left (who, like Jonas’s friend, Fiona, is innocent and clear-skinned, and has just crossed the threshold into adulthood). The sight of my family brings forth this hard-to-describe thing. I don’t blink it back. I don’t tamp it down. I no longer wish for a numbing inoculation. Instead, I thank THE GIVER for bringing me back to my ordinary humanness. Thank you, moviemakers, for infusing love. And now, the “switch in my vein” ― the booster shot that is THE GIVER’s theatrical power ― has gone soul-deep. Finally, finally, my moviegoer’s seat is a good place to be. Because now I see, that even at its darkest moments, this film is a celebration of joy, choice, truth. It lets us rejoice in all that is base in our lives ― pain, conformity, dishonesty ― because, through its lens, THE GIVER reveals a telling reality. It shows us that the ugliest shades of the human condition allow the sun’s light, by its brilliant contrast to black-and-white, to shine even brighter. In the last moments of the film, I’m filled with contemplation about death and life ― the life of one’s spirit that can only flourish through the discovery of being an ordinary human. As THE GIVER’s concluding scene hurls forward, I rest easy in my moviegoer’s seat. Yes, yes, I’ve read the book. I know what’s coming. What’s just ahead is one word. It is the final word in Lois Lowry’s extraordinary novel. And it is the last utterance in the movie’s script. Thank you, filmmakers, I whisper in the dark. Thank you for letting me weep at your remarkable achievement. The word that has delivered this promise is: Echo. during the height of the Darfur genocide. Dolphin Tale 2 and the Home School Movie Club Team Up to Create an Exciting Curriculum on Aquamarine Life!